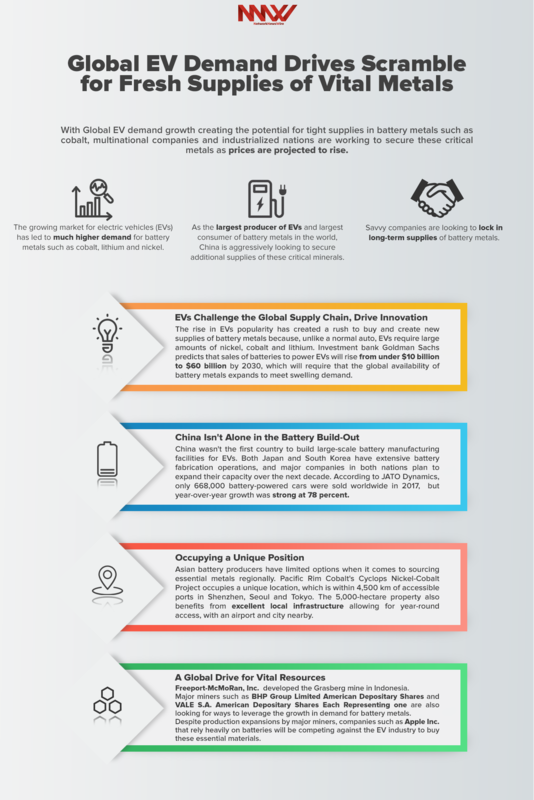 NetworkNewsWire Editorial Coverage: With global electric vehicle (EV) demand growth creating the potential for tight supplies in battery metals such as cobalt, multinational companies and industrialized nations are working to secure these critical metals as prices are projected to rise. In addition to creating new demand for battery metals, EVs are also challenging nations to compete in order to expand battery-producing capacity. Chinese, Japanese and South Korean companies are all working to build-out their battery production infrastructure at a rapid pace. China’s BYD Auto. Company is currently one of the largest producers of both EVs and batteries for EVs. The company plans to expand its battery manufacturing capacity to 60 gigawatt hours by 2020, nearly half of China’s total battery manufacturing capacity in 2017. BYD is part of the Chinese government’s plan to become a world leader in EV production. Beijing has spent billions of dollars to support the EV industry over the last decade. According to Chinese research company Gaogong Industry Research Institute, Chinese battery makers held seven of the top 10 slots on the list of the world’s largest suppliers of lithium-ion batteries for EVs last year. BYD ranked third globally, and China’s Contemporary Amperex Technology Ltd. (CATL) ranked as the world’s top EV battery manufacturer. Bloomberg New Energy Finance estimates that China will produce 70 percent of the world’s electric-vehicle batteries by 2021. China wasn’t the first country to build large-scale battery manufacturing facilities for EVs. Both Japan and South Korea have extensive battery fabrication operations, and major companies in both nations plan to expand their capacity over the next decade. According to JATO Dynamics, only 668,000 battery-powered cars were sold worldwide in 2017, but year-over-year growth was strong at 78 percent. Roughly 82 million passenger cars were sold in the same year, which offers some idea of the potential market size for EVs. There is neither a lack of government support nor a lack of demand for EVs. One of the only areas where EV growth could face problems may be the supply of battery metals such as nickel, lithium and especially cobalt. Until recently, cobalt was a by-product metal and hadn’t been mined as a primary mine product since the World War II. In addition, currently, more than 60 percent of the world’s cobalt is mined in the Democratic Republic of Congo. Not only is the DRC difficult from a labor-rights perspective, the country also has a long history of violence and an inconsistent record of shipping mineral resources. As an initial step in that direction, Pacific Rim recently signed a preliminary offtake agreement with Beijing Easpring Material Technology, recognized as an industry leader in China, to purchase nickel sulphate and cobalt sulphate from the company’s Cyclops project for an initial term of five years. Indonesia’s record on allowing the development of large-scale mines is strong, and the Cyclops Nickel-Cobalt Project is closer to Asian ports than either Africa or Australia, boding well for the success of this venture. Asian battery producers have limited options when it comes to sourcing essential metals regionally. Pacific Rim Cobalt’s Cyclops Nickel-Cobalt Project occupies a unique location, which is within 4,500 km of accessible ports in Shenzhen, Seoul and Tokyo. The 5,000-hectare property also benefits from excellent local infrastructure allowing for year-round access, with an airport and city nearby. The project is a relatively new development, unlike many cobalt projects in the West, which have been mined-out sporadically over the last century. Pacific Rim Cobalt is exploring for cobalt in a jurisdiction that has produced some of the biggest mines in human history. Freeport-McMoRan Inc. (NYSE: FCX) developed the Grasberg mine in Indonesia. It is the world’s largest gold mine and second-largest producer of copper. The mine operates in the remote highlands of the Sudirman Mountain Range in the Papua province, located on the western half of New Guinea. Freeport-McMoRan and its predecessors have been the only operator of exploration and mining activities in the area since 1967. Major miners such as BHP Group Limited (NYSE: BHP) and VALE S.A. (NYSE: VALE) are also looking for ways to leverage the growth in demand for battery metals. BHP is a world-leading resources company that extracts and processes minerals, oil and gas. The company is headquartered in Australia but sells its products worldwide. BHP announced last year that it would be trying to sell as much as 90 percent of the output from its Australian Nickel West operations to the battery sector. With its primary focus on mining, Vale is expanding production at its Voisey’s Bay nickel mine in Canada, and the cobalt produced there is already under contract to waiting buyers, including Wheaton Precious Metals Corporation. The company is the world’s largest iron ore and nickel producer, with operations in other mineral sectors as well. VALE invests in research studies around the world to identify new mineral reserves, and its teams of geologists and engineers use techniques ranging from rock-sample collection and subsoil drilling to satellite image analysis to identify the presence of minerals. Despite production expansions by major miners, companies such as Apple (NASDAQ: AAPL) that rely heavily on batteries will be competing against the EV industry to buy these essential materials. Cobalt is a critical ingredient in the tech giant’s core product line, including iPhones, iPads, Apple Watch and MacBooks. Recognizing the growing demand for the mineral used in its lithium-ion batteries, Apple may be negotiating directly with miners to secure acquisition of the precious metal annually for at least the next five years.